- CAD rate set for more losses as BoC U-turn continues says HSBC. - Economy weakening and BoC rate hike cycle now looks to be over. - OIS market is now pricing a BoC interest rate cut before year-end. The Canadian Dollar is on course to hit fresh 2019 lows against its U.S. rival over the coming months, according to strategists at HSBC, who've told clients they expect the Bank of Canada (BoC) to continue retreating from its once-hawkish interest rate stance. Canada's Loonie has suffered a volatile few months amid large swings in oil prices and after the Bank of Canada backed away in January, from earlier guidance that had suggested it might raise rates as many as three times in 2019. The BoC told markets in January that it will be much more slow to raise rates this year than it had previously suggested. In March the BoC qualified that new message when it told markets "the outlook continues to warrant a policy interest rate that is below its neutral range". "There could be scope for the CAD to weaken further in the weeks to come. The BoC pivot away from its tightening bias has only just begun and the challenges to the Canadian economy are likely to mount. 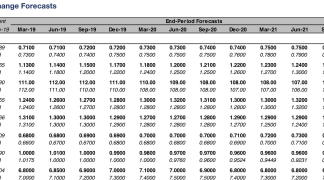 We have long questioned the wisdom of the tightening in the first place and so the risk is that the bite on activity those higher rates are inflicting may prove especially pronounced," says Daragh Maher, U.S. head of FX strategy at HSBC. BoC Governor Stephen Poloz has cited a range of factors as being behind the shifting interest rate stance, including a slowdown in both domestic and global economies that could easily undermine the inflation outlook on the path ahead. "A heavily indebted consumer is facing the challenge of heightened funding costs courtesy of those earlier rate hikes. Interest rate-sensitive pockets of consumption are already showing evidence of a slowdown. The BoC has described the weakness in activity as a detour from its forecasts which has proven longer than expected. We think the detour could extend with attendant CAD weakness," Maher writes, in a recent note to clients. 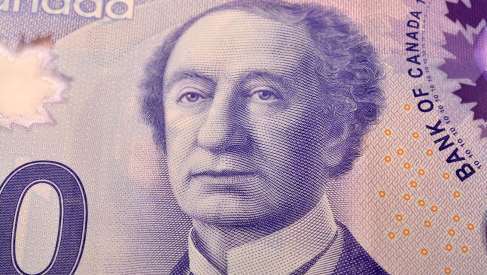 Maher says Canada's labour market is "the one bright spot" in Canada's economy at the moment and the only thing that could justify an optimistic Bank of Canada. But it's also a lagging indicator and therefore, one of the very last places that signs of an economic slowdown can be expected to show up. The BoC raised its interest rate three times last year, leaving it at 1.75%, and until year-end markets were betting on a similar number of hikes being delivered in 2019. But since the March policy statement from the BoC, investors have all but given up hoping to see movement on the policy front this year. This has seen pricing in the overnight-index-swap market turn from having provided a tailwind of support to the Loonie late last year, to becoming a weight around the ankles of the Canadian currency. As a result, the market-implied Canadian cash rate for December 04, 2019 was just 1.64% on Monday. That is below the current cash rate of 1.75% and suggests that investors see a strong possibility of a BoC interest rate cut being delivered by year-end. Maher says investors are likely to continue betting this way in 2019, hurting the Loonie in the process. "USD-CAD has gravitated back towards support at 1.3350 but we expect a fresh move higher to challenge the recent high of 1.3468. USD-CAD has tended to follow 2Y yield differentials reasonably well, but looking at the relationship between the two over the last year, it would be more consistent to see USD-CAD closer to 1.36 currently," Maher says. "But the pressure for a fresh push higher in USD-CAD is growing." Maher and the HSBC team have been betting on an increase in the USD/CAD rate since the beginning of February. They entered their trade at 1.3110 and are targeting a move up to 1.3480.